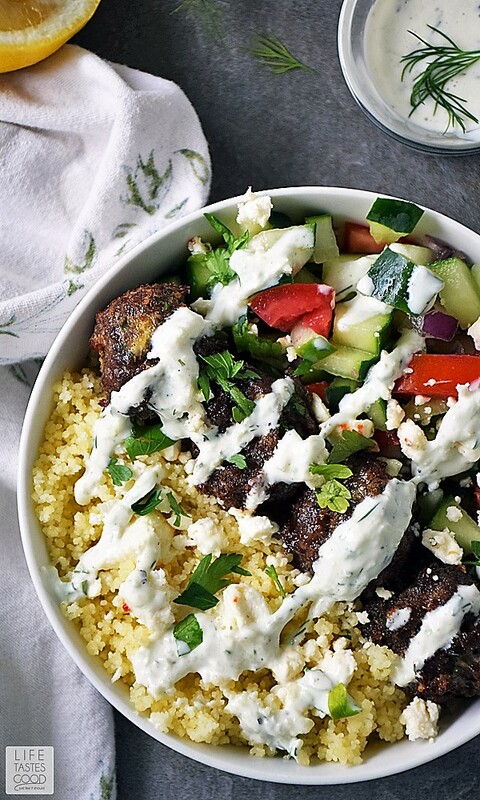 My Greek Bowl with Mediterranean Meatballs and a tomato cucumber salad over couscous is drizzled with creamy Tzatziki Sauce for a satisfying dinner or lunch. This easy beef recipe, loaded with fresh ingredients, is an explosion of exciting flavors in every bite! Last month I was one of 15 #SundaySupper Tastemakers invited to experience a 2-day farm to fork tour with the Florida Beef Council. During the 2-day event we were immersed into the Florida cattle industry. We learned about raising beef cattle in Florida through educational sessions with the University of Florida professors as well as professionals in the beef industry. Additionally, we had the unique opportunity to tour cattle ranches and get up close and personal with some Florida cows. We were fortunate to meet and spend time with some of the hard-working ranching families who raise beef cattle in Florida. 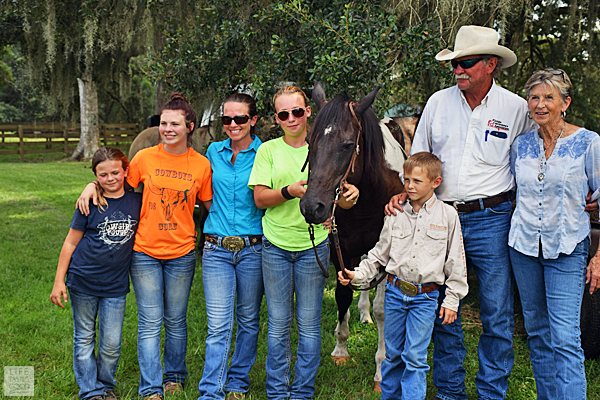 Below is the lovely Hobby family of Rockin' H Ranch in Levy County, FL. What a great time we had at their ranch. There was also a mini cooking competition. My Team included Isabel of Family Foodie and founder of the Sunday Supper Movement, as well as the very talented Katie of Katie's Cucina. We came in a close 2nd with our Greek Bowl recipe! Our hosts also treated us to an amazing dinner on the Suwannee River, and a real Florida breakfast too. The food was sooo good y'all! We know how to eat down here in Florida! All cows are grass fed. Grass finished means the cow has only eaten grass during its lifetime. There is not enough land in the US to support raising all grass finished cows. We need to feed beef cows a well-balanced combination of grain and grass in order to sustain the supply of beef in our country. 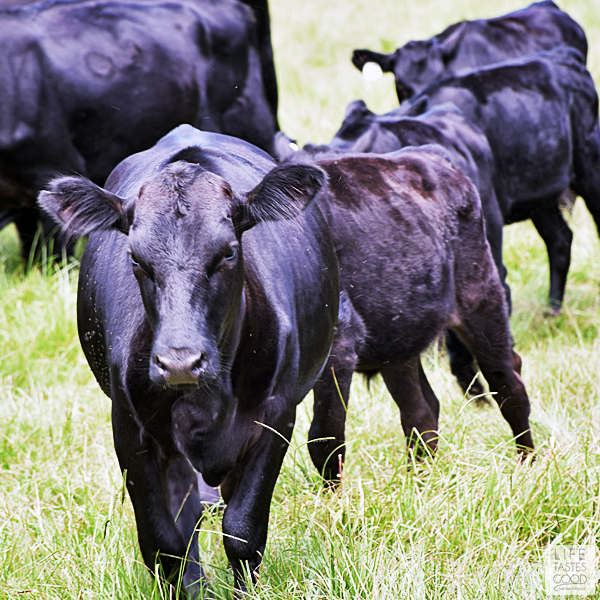 The grain ranchers feed to cattle is carefully formulated to ensure a well-balanced and nutritious diet. It was clear, the health of the animal is a top priority, and farmers and ranchers are feeding the world more effectively than ever. Beef has minimal hormones. There is more estrogen in 1 serving of cabbage than there is in 1 serving of hormone injected beef. Beef is heart healthy! Eating lean beef as part of a heart-healthy diet and lifestyle can lower LDL (bad) cholesterol by up to 10% as much as any other recommended heart-healthy diet. Beef is a low calorie protein source. You have to consume 6 Tbsp. of peanut butter containing 564 calories to equal the 25g of protein found in 3 oz of beef with only 154 calories. I am so thankful to the farmers and ranchers who work tirelessly to ensure we have fresh, healthy, unprocessed food to eat. I can't imagine a world without them! I'd like to thank the Florida Beef Council as well as the UF professors, Florida beef cattle ranchers, and beef industry professionals for taking time out of their busy schedules to host the #FLBeefImmersion weekend in order to educate us about the importance of beef and the cattle industry in Florida. To learn more about the beef industry, please visit the Florida Beef Council and take a look around. There is a lot of great information. 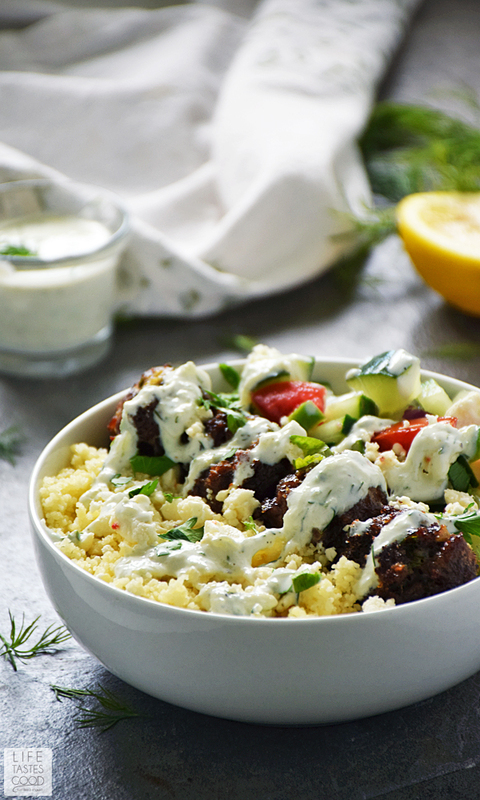 Now that you know beef is a healthy addition to your diet, be sure to add the ingredients for my Greek Bowl recipe to your shopping list. You are going to fall in love with these meatballs! This recipe was inspired by my very popular Mediterranean Meatballs Gyro Sandwich recipe. 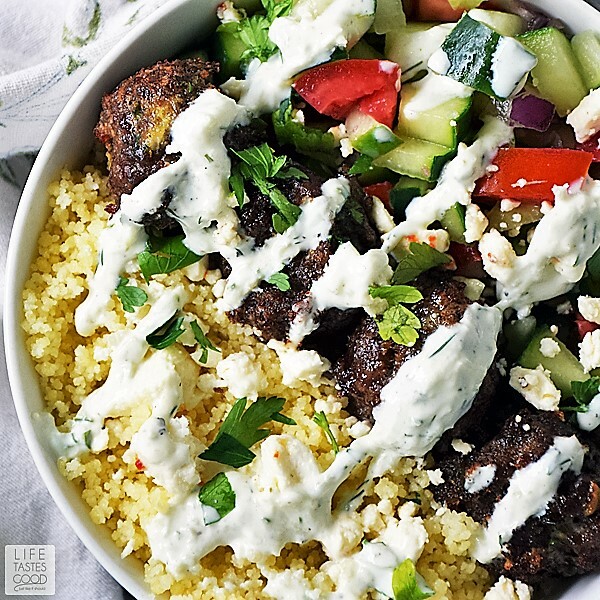 Visit that recipe for step-by-step photos that show you how to make the meatballs, as well as the Tzatziki sauce used in this recipe. Combine 1 cup Greek yogurt with 1/4 cup grated cucumber, 1 teaspoon freshly minced garlic, 1 teaspoon olive oil, 1 tablespoon fresh dill, 1/2 teaspoon sea salt, and 1/4 teaspoon pepper. Mix in 1 tablespoon fresh lemon juice and stir to combine. Give it a taste and adjust the flavors to your liking. Cover and refrigerate until ready to serve. Preheat the oven to 425°F. In a large mixing bowl, combine 1 pound ground chuck, 1/4 cup dry Italian breadcrumbs, 1 large egg, 2 tablespoons chopped fresh flat-leaf Italian parsley, 1 tablespoon freshly minced garlic, 1/2 teaspoon ground cumin, 1/2 teaspoon sea salt, and 1/4 teaspoon freshly cracked black pepper. Mix well to combine and then form into meatballs. I use a medium size scoop to get them uniform in size, or if I'm away from home I have even used a 1/8 measure cup to measure the meat and then roll into a ball. Place them on a lightly greased baking sheet and bake in the pre-heated oven for about 10 minutes or until cooked through and no longer pink inside. Cooking time will vary depending on the size of your meatballs. While the meatballs are cooking, dice 1 cup cucumbers, 1 cup tomatoes, 1/2 cup red onions, and a tablespoon of flat leaf parsley and combine in a serving dish. Salt & pepper to taste. When the meatballs are cooked through, remove them from the oven to rest. While the meatballs are resting, bring 1 cup water, 1 teaspoon butter, & 1/4 teaspoon salt to a boil in a medium saucepan. Add 1 cup couscous, cover, and remove from the heat. Let stand for 4 minutes and then fluff with a fork. Squeeze the juice of 1/2 a lemon into the couscous and adjust the salt & pepper to your liking. Assemble: Spoon 1/2 cup couscous into each of 4 serving bowls. Top with about a 1/4 cup of the tomato cucumber salad and 4 meatballs. 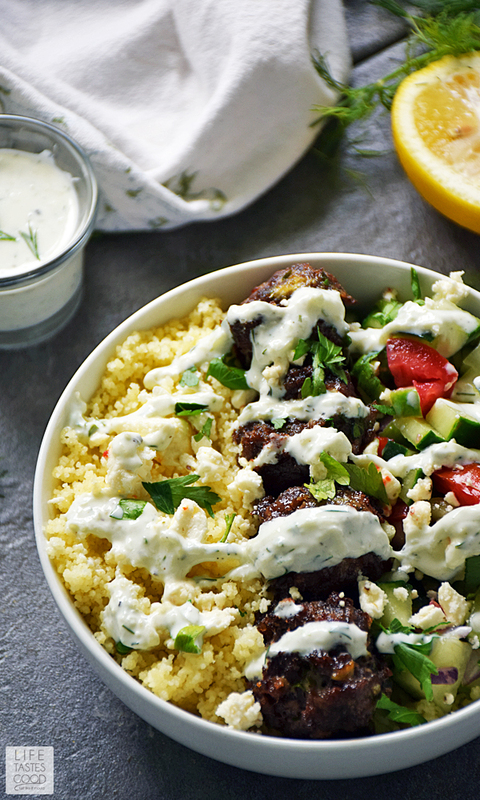 Sprinkle on a tablespoon of Feta cheese (or as much as you like) and drizzle with Tzatziki sauce. Garnish with freshly chopped parsley and enjoy! I want to make this. We're having a Greek themed Saturday, spanakopita is on the menu so far, this would be a nice addition. This recipe really helped me on my menu ideas. Thanks! Thank you for this refreshing and yummy recipe. My family loves it!!! Absolutely delicious dinner! I love mediterranean food so much! Can't wait to make this again! I don't add dill to my tzatziki and I added oil and vinegar to the salad. I served this with hummus and pita bread! Looks delicious...is there a way to print it for future use. 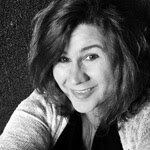 Michele, I'm sorry for the delayed response. I'm happy to send a printable version via email. Please contact me at life_tastes_good@yahoo(dot)com and I will email you a printable version. Thanks! This sounds delicious! I'm definitely adding it to my menu. Have you ever tried freezing the cooked meatballs? I'd love to try that for a quick dinner.